Salmon kept a catalogue of his paintings, numbering each painting and indicating where he was when it was painted. This is number 395 which, according to the catalogue, must have been second to last painting he did in 1823 in Liverpool, before he emigrated to Boston. The main subject is rigged as a snow, with a small mast behind the mainmast on which the fore and aft mainsail is set. She flies a Union Jack on the foremast, requesting a pilot. She has false gunports painted on her side. A careful look at the quarter-deck shows four guns concealed on each side. To the right is a pilot cutter, Kitty #2, built in Liverpool in 1787. Replaced in 1824, she became a fishing boat, ending her ninety year career in Sierra Leone. The vessel to the left may be a stern view of the main vessel, a common practice in marine painting. 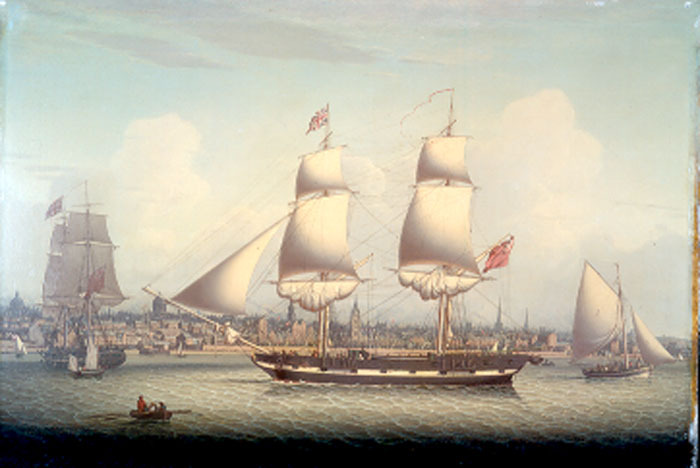 Compare this skyline with the Salmon 1809 painting and see how many more buildings crowd the Liverpool waterfront.